1 Peel the bottom third of the asparagus, cut off any woody ends and cut the spears in diagonal 3-4 cm long pieces, put aside the asparagus tips. Rinse rhubarb, trim and also cut into approximately equal sized diagonal pieces. Boil 2 tsp sugar and 1 tablespoon lemon juice in a pot of salted water. Put in the asparagus pieces and simmer for about 5 minutes. Add the tips and simmer 2 more minutes. Finally, add the rhubarb, cook about 1/2 minute, then strain all together, rinse and drain well. 2 Rinse the spinach and mint, shake dry or spin, trim the spinach and pluck off the mint leaves. Trim, rinse and halve the strawberries. Puree approximately 150 grams (3/4 cup) strawberries and press through a fine sieve. Stir in the vinegar, lemon juice and remaining sugar and oil and season with salt. 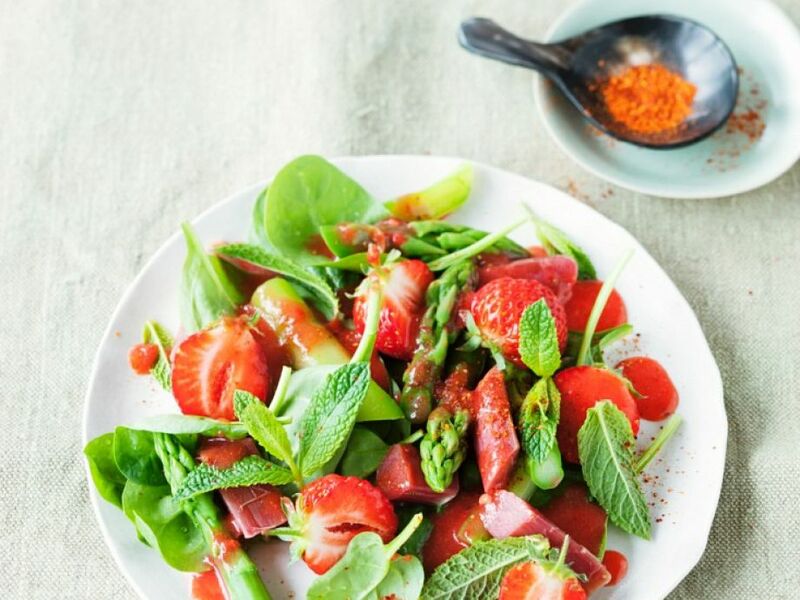 3 Arrange the remaining strawberries with the spinach, mint, asparagus and rhubarb on plates. Pour the dressing over salad and serve seasoned with Espelette pepper.